The GlideinWMS software is available via OSG as RPM (the Frontend, the Factory and HTCondor with special configurations) and as TAR bundle (from the links below in this page). The supported platforms are currently RHEL6 and RHEL7 (and derivates like CentOS and SL). RPM installations are more structured. Installations from the TAR files allow more flexibility. GlideinWMS Frontend RPM is available for download from the OSG RPM repository. The installation process will install and setup also the User Pool and User Schedd. Refer to OSG GlideinWMS Frontend installation guide for details. 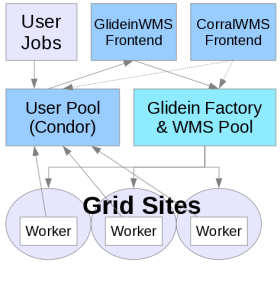 GlideinWMS Factory RPM is available for download from the OSG RPM repository. The installation process will install and setup also the WMS Pool. Refer to OSG GlideinWMS Factory installation guide for details.